There's nothing like the classic princess-cut diamond, but many brides want a look that's a little more unique. From fancy-colored diamonds to settings that evoke a bygone era, there are numerous creative options featuring this beautiful cut. For purchasing information, click on the "Buy Now" link on any of the following images. Styles inspired by the designs of yesteryear always yield unique rings. This exquisite platinum split-shank ring features a 0.72-carat princess cut diamond surrounded by an additional total carat of smaller diamonds. It's a head-turning look that's a big step away from the classic princess solitaire. This ring retails for about $5,400. Nothing takes your traditional princess-cut diamond to the next level like a little pop of ruby red. This incredible design features a .52 carat princess-cut diamond as the centerpiece. A unique split band in 14k white gold is adorned with alternating colorless diamonds and striking red rubies. It retails for about $3,500. A unique setting can make all the difference in a princess-cut diamond ring. This sweeping 10k white gold setting adds creative flair to a star-set 0.67-carat princess diamond. Smaller diamonds accent the shank of the ring and add even more sparkle. This ring retails for about $2,500. The shape of the surrounding setting can dramatically change the look of a princess-cut diamond. In this case, a wreath of round diamonds surrounds a 1.5-carat princess-cut center diamond. The 10k yellow gold setting further sets off the interesting geometric lines of the gems. This ring retails for about $9,200. Sapphires can add a beautiful, one-of-a-kind appeal to a standard princess-cut diamond. In this gorgeous ring, a center princess-cut diamond is surrounded by four marquis-cut sapphires. A ring of round diamonds frames the center stones, and more round diamonds accent the 18k white gold split band. Featuring 0.4 carats of diamonds and 0.39 carats of blue sapphires, this ring retails for about $1,300. Band-style rings can also feature princess-cut diamonds in creative settings. In this undulating 14k rose gold band, 0.3 carats of sparkling princess-cut diamonds add even more visual interest to the interesting shape of the ring itself. This unique band retails for about $1,500. For a truly unique look, a black diamond is a great way to jazz up a traditional princess cut. In this exquisite ring, a 1.65-carat princess-cut black diamond is simply set in a round white diamond of 18k white gold. This pretty ring retails for about $1,800. Diamonds come in a wide range of fancy colors, including pink, blue, and yellow. In this ring, a 1.84-carat fancy yellow diamond is surrounded by a frame of colorless diamonds and set in a platinum band. It retails for just under $3,300. No matter which diamond color, setting, or precious metal you choose, there are dozens of unique options when it comes to princess-cut diamond rings. Whether you're shopping for an engagement ring or just looking for a special piece of jewelry, the perfect ring is out there waiting for you. By definition, a classic three stone diamond engagement ring has one central gem flanked by two accent side stones. The princess diamond shape is especially popular for these simple yet elegant rings that represent a couple's past, present, and future. In this pretty ring, a .56 carat princess cut center stone is flanked by gorgeous round-cut diamonds, and small channel-set diamonds in a white-gold band. It retails for about $2,000. Channel-set diamonds give any ring a simple, modern look. 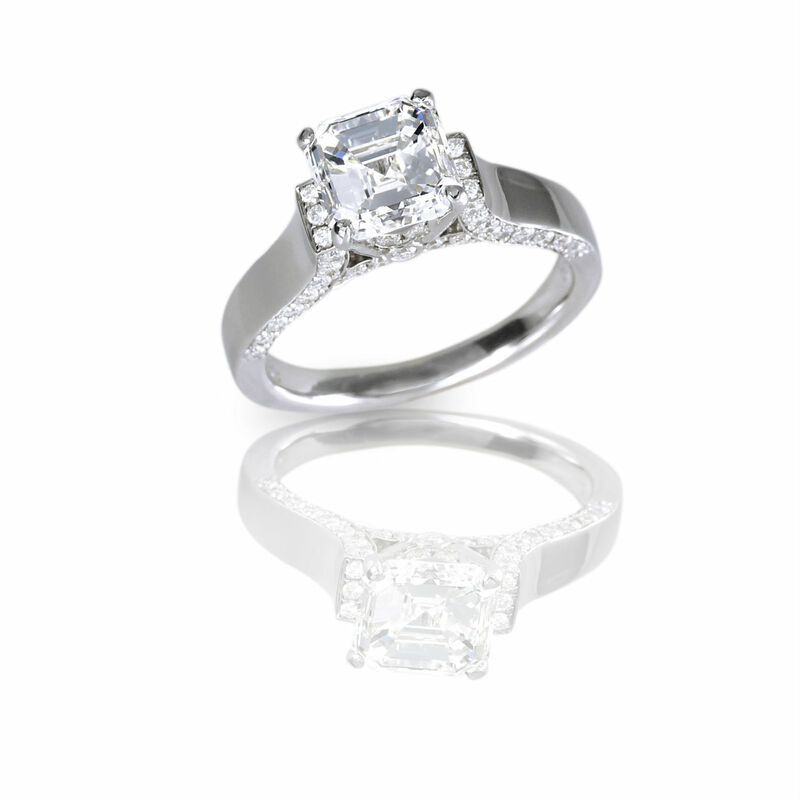 In this beauty, a 0.75-carat princess cut diamond is prong-set in a platinum band. A row of channel-set diamonds extend down each side of the band, offering sleek, contemporary style. This ring retails for just under $21,000. Side stones don't have to be round or princess-cut diamonds. In fact, a baguette shape lends geometric grace to a center princess-cut diamond. This amazing ring features a 0.50 carat princess-cut diamond in the center flanked by rows of baguettes and round diamonds, all set in platinum. It retails for about $4,000. A stepped or terraced design provides a unique accent for the traditional princess-cut diamond. In this unique engagement ring, a 0.80-carat princess-cut center diamond is flanked by two baguette-cut diamonds. A row of channel set diamonds extends along either side of the bold platinum band. This ring retails for about $22,000. Side stones allow for some unique and lovely engagement ring settings. In the case of the beautiful ring, the sparkling braided band is the perfect setting for the three princess-cut diamonds. This elegant ring has 1.80 carats of diamonds in a platinum band and retails for about $4,400. Dozens of tiny diamond side stones can further enhance the sparkle of a princess-cut center stone. In this lovely ring, a 1.51-carat princess-cut diamond is enhanced with a halo made up of smaller baguette and round diamonds. A triple row of diamonds enhances the top of the band. This ring retails for about $2,500. Side stones can add antique style to a traditional ring. This stunning Art Deco-inspired design features a 0.75-carat princess-cut center diamond surrounded by filigree and smaller diamonds. It's an exquisite platinum engagement ring and retails for about $6,900. Diamonds don't all have to be colorless. In fact, adding a sparkle with a colored diamond is a great way to make your ring truly unique. In this exquisite example, a princess-cut diamond is flanked by two blue diamonds. The whole setting sparkles atop a platinum band flanked with three more diamonds. This ring retails for about $2,500. The addition of side stones, whether they are diamonds or other gems, makes for many unique princess-cut diamond rings. Examine all of the possibilities before deciding on the perfect ring for you.